With the Wedding season quickly approaching, the Tuxedo and Dress Box die cut boxes from Creative Cus and More make creating Wedding/Shower favors a breeze! I embossed the White Dress Box with the Cuttlebug Stylized Flowers Folder, tied on a pretty Pink Satin Ribbon and added a Felt Flower and a Basic Grey Half Pearl. To finish the Tuxedo Box, I simply added some Basic Grey Black Half Pearls and a Pink Felt Flower with a Basic Grey Half Pearl. Creating these beautiful favors only takes a few mintues! Be sure to stop back later tonite for the Creative Cuts and More Blog Hop - this month we're sharing Die Cut projects with "mom" in mind. For those of you who missed out on the Holiday Treats Apron Kit from Creative Cuts and More, I'm happy to let you know more of these wonderful kits are back in stock. Click here to see the kit I previously posted on my blog. These are adorable Lisa...and so perfect to feature on a guest Wedding table..
going to check out your links.. These are so neat!! What a great idea for favors! Nicely done! Thaanks for sharing! Lisa, i love wedding theme. 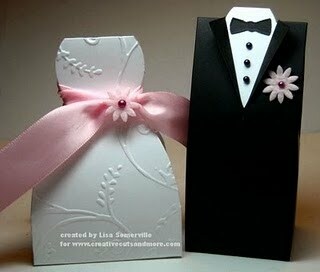 Your wedding favors are elegant and fabulous!! I want to do some like that. Oh wow, I love these. Fabulous. Really cute! Look like lots of work tho for multiples.